We’d love your help. 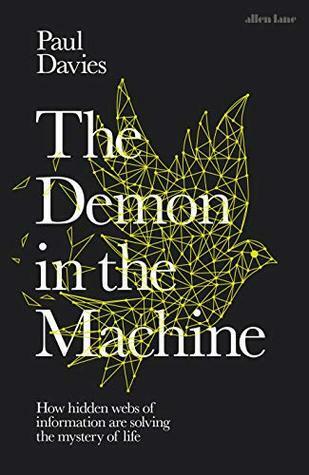 Let us know what’s wrong with this preview of The Demon in the Machine by Paul Davies. To ask other readers questions about The Demon in the Machine, please sign up. This book is dense, but fabulous for bringing together the most fundamental connections between physics and biology. Davies delivers a clear-eyed, science-based examination of the state of knowledge and generates insights for the origins of life, but also for the power of our information age--when information itself has power. Insights and many levels from scientific history and discovery to the cutting edge of contemporary knowledge. Paul Charles William Davies AM is a British-born physicist, writer and broadcaster, currently a professor at Arizona State University as well as the Director of BEYOND: Center for Fundamental Concepts in Science. He has held previous academic appointments at the University of Cambridge, University of London, University of Newcastle upon Tyne, University of Adelaide and Macquarie University. His re Paul Charles William Davies AM is a British-born physicist, writer and broadcaster, currently a professor at Arizona State University as well as the Director of BEYOND: Center for Fundamental Concepts in Science. He has held previous academic appointments at the University of Cambridge, University of London, University of Newcastle upon Tyne, University of Adelaide and Macquarie University. His research interests are in the fields of cosmology, quantum field theory, and astrobiology. He has proposed that a one-way trip to Mars could be a viable option.